Epson XP900 all-in-one printer can perform combined functions of printing, scanning and copying. It proves to be a great choice for photographers who want printing assistance at home. This printer is able to print up to A3 page size. Epson XP900 is an impressive printer if one goes by its looks. It has excellent connectivity options and one can even connect it through smartphone or tablet. It weighs approximately 8.8 kg so it is easy to lift and carry. It measures 18.8 x 14 x 5.8 inches. It can be controlled by a control panel which has 2.6 inches diagonal. It has an SD card and a USB port which offer excellent connectivity options. It uses individual Epson XP-645 Ink Cartridges which means the cartridge that runs out can be replaced. The print quality is good especially in case of photograph printing as it uses Photo Black ink. Epson XP900 is a all-in-one printer that can print, scan and copy and is a good option for those who want to print photographs at home. It offers excellent connectivity options and has a great print quality. It is simple and easy to use and can print A3 size paper as well as thick paper. But the only problem with this printer is that it is not suitable for printing black and white documents. How to replace ink cartridges in the Epson XP-900 printer? When replacing the cartridges before they are expended. Close the scanner unit and then press the ok button. Q. Can Epson XP-900 printer fax the document and provide coloured output? A. Sorry, this printer does not have a fax feature. Epson XP-900 printer can only print, scan and copy the documents. Q. I am unable to find other Epson ink cartridges on your site. Please guide. A. On the head section of the website, type 'Epson' in the search tab. Then click ‘View cartridges for this printer’. A list of printers will be displayed, click on your printer model. Or, on the same page, you can manually select your Epson Printer Type & Model to find your cartridge. Q. I need to submit my college project soon. But I am not receiving good quality prints from my own printer. Will Epson XP-900 printer fulfill my needs? A. Yes, this Epson printer can fulfill your good quality printing need. The printer offers a high resolution of 5760 x 1440dpi to provide crisp output. Q. I want to place an order of compatible Cyan Epson XP-900 ink cartridges. But, I am unable to proceed after adding the product into the cart. Please guide. Thanks in advance! Select Cyan Epson XP-900 ink cartridge and enter the quantity required. Then click 'view shopping cart' and proceed towards checkout. A form will appear. Fill the required information. Note that details marked with an asterisk (*) is necessary to fill. Moving ahead, agree to the Terms and condition and then click 'Place Order Now'. In case if any problem occurs, then you can call us at 048 30833221. Q. Is the printer’s warranty affected if I use compatible Epson XP-900 ink cartridges with the original ones? A. No, the printer’s warranty is not affected if you use compatible ink cartridges with the original ones. Please note that the print quality of the output may vary. Q. What conditions should be kept while purchasing Epson XP-900 Ink Cartridges from your site? Q. For my Epson XP-900 printer, my Cyan coloured Epson XP-900 Ink Cartridges are empty. Do you offer individual pack of Cyan ink cartridges? Or I need to purchase multipack? A. We at Printerinkcartridges.ie , offer both single and multipack of ink cartridges. You can purchase individual Cyan coloured ink cartridges or multipack as well. For more details of these cartridges, click: https://printerinkcartridges.ie/epson-33xl-cyan. Q. For this printer, what paper size is suitable for printing? A. You can print on A3 size paper as well as thick paper. Q. What if my individual ink cartridge is empty or needs replacement? Can I replace that empty cartridge or I need to replace whole Epson XP-900 ink cartridge? Please help. A. With the use of Epson XP-900 printer, you don’t need to replace whole ink cartridge. The printer uses individual ink cartridges, which means you can replace the cartridge that runs out. Q. Can I use this printer for my photo printing job? A. Though the printer is not suitable for printing black and white documents, the printer is good especially in case of photographs as it uses Photo Black Ink. It is a great choice for users who want printing assistance at home. Also, it offers very high quality print in case of photographs, with the resolution of 5760 x 1440 optimised dpi. Q. Is it okay to use an expired Epson XP-900 ink cartridge in the printer? What are the possible risks related to it? A. We recommend not to use expired ink cartridges in the machine. By doing so you may have to face poor print quality issues. Besides the print quality, there are no major risks related to using expired ink cartridges. If you wish to give a try, start with a test print. If that gives you a good print quality you can continue using it. But do not repeat using expired ink cartridges. Q. I cannot find pre-holed papers in the recommended list of media specifications in my Epson XP-900 user guide. Just wanted to make it clear whether I can use a pre-holed paper with the printer or not. Could you please help? A. Unfortunately, you cannot use pre-holed media for printing with Epson inkjet printers. The machine does not support pre-holed media and that can lead to paper jams or other mechanical problems. Please follow the list of compatible media types specified in the user guide. Q. The colour combination on the printed photo is different from that on the screen. Is this because I have installed two original Epson XP-900 ink cartridges and two compatible ones? Could you please help? Thanks. A. Sure. Often there is a delicate difference between the colour displayed on the screen and the final output. But as you said that you have installed two genuine ink cartridges and two compatible ink cartridges this might cause a greater colour difference. This happens because both the ink cartridges are designed by different manufacturers. Q. Does Epson XP-900 all-in-one support Google Cloud Print? A. Yes. 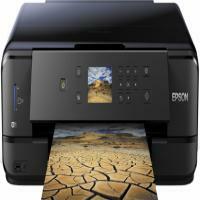 The Epson XP-900 printer can be used with Google Cloud Print. Without any requirements for setup you can directly start using the Google Cloud Print application with your printer. Q. Hi, I am using Epson XP-900 printer. How can I update the firmware? A. To update the firmware you need to connect your printer to the Internet, you can update the firmware using the control panel. This will help the printer to perform even better. Also, this will add some new functions to your printer. For this go to Settings from the home using the left or right key and then press OK. Then select Firmware Update using the up-down key and then press OK. Again select Update using the up-down key and press OK. The printer will start to check for available updates. The screen will show the message if any updates are available. Follow the instructions displayed on the screen. This will help you to update the firmware. Q. I am using Epson XP-900 printer, the print quality didn’t improve even after aligning the printheads or replacing the old Epson XP-900 Ink Cartridges. What should I do? Q. I am using Epson XP-900 printer, nowadays I am getting poor quality printouts. What could be the reason? Q. Hi, I bought a new Epson XP-900 printer, I am not able to insert the paper properly into the printer. Please help. A. First check if the printer is placed on a flat surface and is supported by the required environmental conditions. Use the paper that is supported by your printer. Take care while handling the paper. Make sure that you don’t load the paper more than the maximum number specified. Set the paper type and paper size in the printer before trying a printing task. Q. Hi, my Epson XP-900 printer is unable to print from the network connection. What should I do? A. In case you have changed the access point, problems like this may happen. You need to again connect your PC with the same SSID as the printer. Then turn off the devices and wait for sometime, and then turn on first the access point, then your PC and finally your printer. It will be good if the PC and the printer is placed close to the access point for better communication. If you are using Windows, then click on Print Queue on the printer driver's Maintenance tab, and then check if there is any incomplete printing jobs. Cancel them and make sure the printer is not offline and is selected as the default printer. Then select Connection Check under the Network Settings under Settings tab and then print the network connection report. Then follow the printed solutions to connect to the network.